(SAINT JOSEPH, Mo., Sept. 20, 2017) Keeping a work-life balance in check takes effort, but setting realistic goals and making both her health and her horses’ health priorities has allowed professional cowgirl Emily Miller to take the rodeo world by storm this year. BioZyme® Inc., is excited to announce that Miller is one of its newest Vitalize® ambassadors. “I’ve always had a need for speed, so that is how my involvement in the sport of rodeo evolved,” said the animal loving Kansas native who now resides in Weatherford, Okla.
And, when she says speed, she means it. 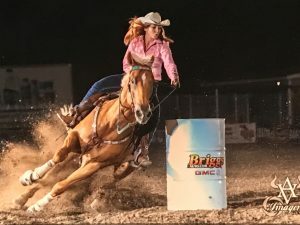 Miller is currently ranked in the top 15 in the sport of barrel racing, with the dream of making her first appearance as a National Finals Rodeo contestant in Las Vegas later this year. But being ranked in the top 15 hasn’t happened overnight, nor has it come easily. Miller works full-time as a registered dental hygienist, and therefore typically only competes on weekends. However, with high-quality, healthy horses she has been able to achieve the goals she set for herself: win the Prairie Circuit, check; win the RAM National Circuit Finals Rodeo in Kissimmee Fla., and qualify for Calgary Stampede, check, check; perform well at Calgary and Cheyenne, check, check. One goal at a time, and one day at a time is how this young cowgirl balances her profession and her passion. Miller started using the Vitalize High Performance pellets on Jet, one of her more nervous horses that is ulcer-prone, to see if it would make a difference. After about 30 days, she noticed a healthier, calmer horse with a shinier hair coat. She introduced the supplement to the rest of her horses to keep them healthy and performing. As a Vitalize ambassador, Miller will represent and promote the brand at various rodeos and equine events. She is a firm believer in the products and feeds the Vitalize Equine High Performance pellets daily and uses the Vitalize Equine Recovery Paste when she travels long distances. For more information about Vitalize products, or to find a dealer near you, visit www.vitalizeeq.com.